Here's the pattern I made up to make my adorable Chibi Espeon Plush! Feel free to download & use it, as long as it's for personal-use only! 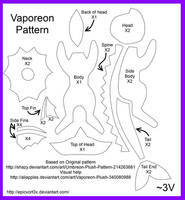 Please do not try to sell this pattern (it belongs to me) or sell any plushies you make from this pattern, as Espeon is the property of Nintendo and it is illegal (and disrespectful!) to profit from others' work. But, feel free to show off your plushies, and link back to my pattern here, please, so others can use it, too! ❦ Please help support my quest in doing what I love for a living! Visit my Etsy shop of clay creations AGSculpts to see my original work, 'favorite' things, share with friends, put in a commission, purchase something you like! Any and all help is greatly appreciated. Made espeon this weekend! 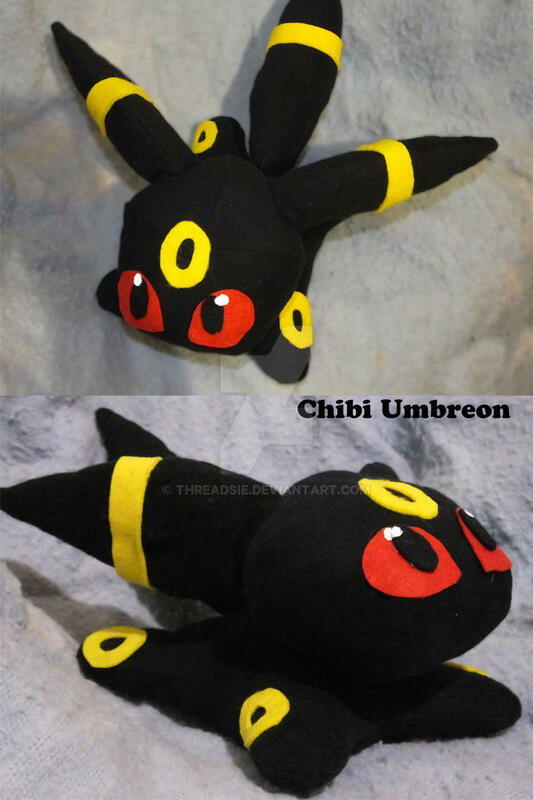 So very cute and I made an umbreon using the head and body as well! Thank you so much for the pattern! Here's a run down, I hope it's helpful. 1. Make the head. First take two of the head pieces and sew them together along one long side, rights sides together. Take two more pieces and do the same. Finally, take the fifth piece and sew on long side to one of your pairs of head pieces right sides together, leaving a gap in the middle for turning. Take the last head pair and line up each unsewn side with an unsewn side of the three piece section. Sew around in a circle, being careful of seam placement. Alternatively you could sew each of the sides together one at a time, just be really careful that you don't leave a hole at the top or bottom of the ball. You should now have a ball, clip little triangles into the seam allowance, optional but makes the ball more smoothly rounded. Turn the ball right side out, stuff, and close the opening with a ladder stitch. Here's a ladder stitch tutorial: www.squishycutedesigns.com/lad… If you haven't done a ladder stitch before you might want to practice on two straight pieces as it can be difficult to keep your seam allowance even on a curved seam. 2. Make the ears. Take an ear piece and position an inner ear piece onto it. Make sure the right side is facing up for both. Sew around the edge of the inner ear piece with a whip stitch, straight stitch, or zigzag. Whip stitch would be hand done. Repeat with the other inner ear piece. Now, take one ear piece that has an inner ear on it, and one ear piece that doesn't, sew together leaving the bottom open for turning. Do the same with the two remaining ear pieces. You can cut little triangles in the seam allowance for a nice roundness as well as cutting a nice sharp point at the ear ends. Turn and ladder stitch closed. 3. Sew together the little under ear things, right sides together leaving an opening for turning. I ended up making my own pattern for these as I found the given ones too small. Ladder stitch closed, there shouldn't be any need to stuff. 4. Make the tail. Take the two tail pieces and sew together, right sides facing, making sure to leave an opening in one straight side for turning. Turn, stuff, and sew closed with a ladder stitch. 5. Sew together the body. Take two body pieces, right sides together, sew along the long edge leaving an opening for turning (this will be the bottom side), take the other two pieces and sew them together, no need for an opening. Finally, take your two sewn pieces (should be on top and one bottom) and sew them together right sides facing. You should have a little inside out body. Cut little triangles in the seam allowance of the feet, and little snips at sharp corners. Turn,stuff, and sew closed with a ladder stitch. Make sure to stuff the feed with little balls first. I also made a little packet of poly pellets to weigh the body down, you could also use some rice (though you then wouldn't want to ever get it wet). 6. You should now have a body, head, tail, lower ear things, and ears. Sew the head to the body making sure your closed opening for the body is on the bottom to hide it, the ears to the head, under ear things to the head, and the tail to the body. Use her photo as a reference and make sure to keep positioning the pieces as you sew them on to make sure they don't end up all strange-like. You will be using a ladder stitch here as well. Lots of ladder stitch practice! You then can make little white eye shines and attach them the same way. Technically, you could have applied the eyes to one head piece each (right side) way back before making the head, but doing it afterwards allows for more precise placement. All that's left now is to make a little circle of red for the head jewel and attach it with a whip stitch. 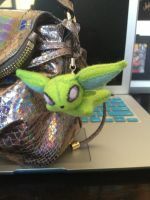 You should now have a cute little Espeon! I sewed most pieces together with the sewing machine, but you could also hand sew this. If you've never really sewn I highly suggest practicing whip and ladder stitch a little first, and maybe making a test ball. Also, chopsticks are pretty nice for turning. I think I'm going to make an evee out of this and at that time I'll try to take pictures of my steps and make a little tutorial (with permission) so everyone can enjoy this adorable free pattern. Be super careful to sew right sides together for anything that gets turned. I tried to make note each time, but likely missed some. why does (almost) everyone make it green? oh i know. they just want a shiny espeon XD. What stitch did you use? This is so awesome and adorable! About how much fabric does this use? I am going to make one! Thank you for posting this, do you have any suggestions for making it into a keychain?